Snowmaggedon 2016 came through last month…except it didn’t. We were all so excited to be getting a good amount of snow up here in the North Georgia Mountains. The city of Atlanta (which is well south of me) pretty much shutdown at noon the day of the expected snowstorm. A state of emergency was declared. Roads were brined. Bread was bought. Seeing milk at the store was like sighting a unicorn. My husband who is in the National Guard was put on alert….aaand it rained, like all day. Finally at around 5 we got maybe, like a super big, stretched out, wishful thinking, maybe, 1/2 inch of snow. Yep, a whole whopping 1/2 inch and we shut down the whole northern part of the state! 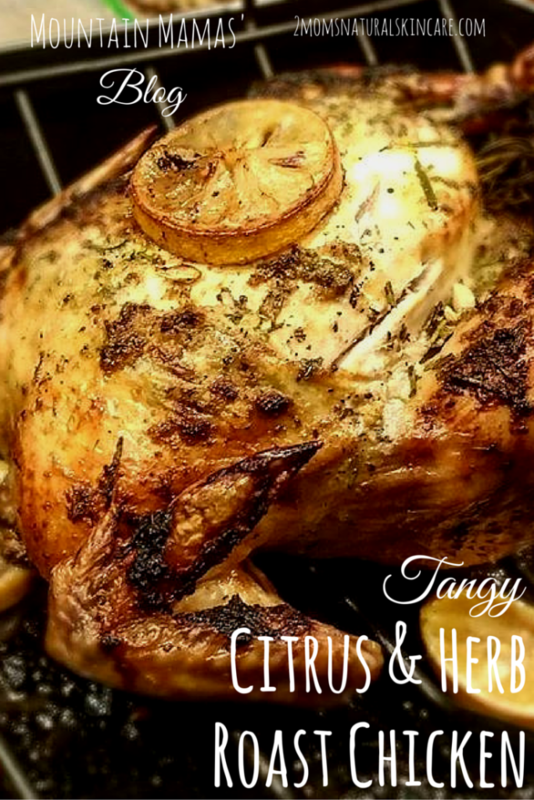 So to rally my downed spirits I decided to make one of my absolute favorite meals Citrus & Herb Roast Chicken. I used an organic pasture raised chicken from a local farm. Not sure where to get your own pastured meat? Check out eatwild.com if you live in the U.S. or Canada. They have listings for many local farms that sell beef, pork, chicken, and dairy. You can also check out my post all about how to Eat Organic On a Budget. 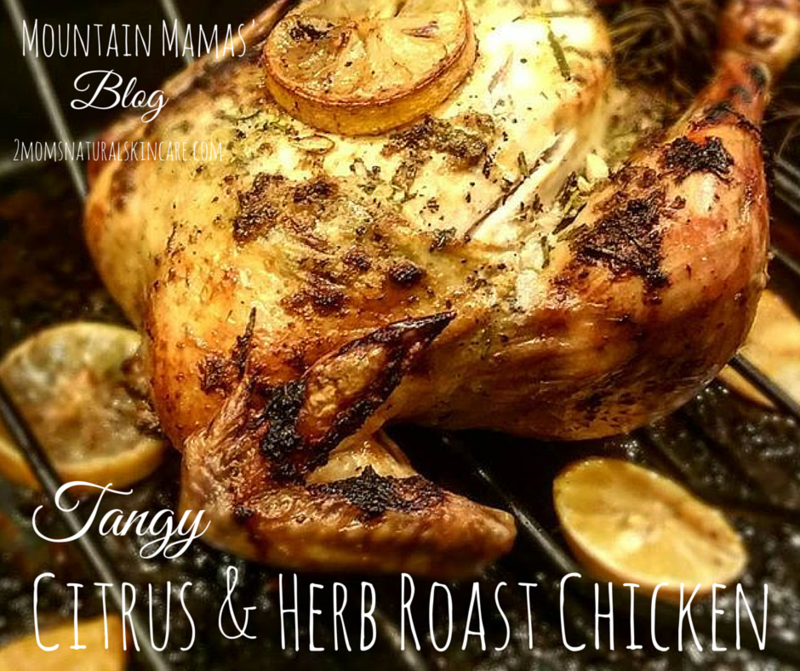 This chickens is delicious and moist with a wonderful citrus tang! Place the chicken breast side up on a rack in a roasting pan. Put the halved lemon, orange, garlic, and sprigs of rosemary and thyme into the cavity of the chicken. In blender combine lemon juice, orange juice, softened butter, rosemary, thyme, onion powder, and salt and pepper. Blend until a paste is formed. Use your hand to spread half of the paste under the skin of the chicken and the remaining half to the outside of the chicken. Tie the legs together with kitchen string. Place in oven and roast 1 hour basting occasionally and adding chicken broth to the pan when necessary. Place slices of orange and lemon on the top of the chicken and add the remaining slices to the broth and drippings mixture in the roasting pan. Continue baking and occasionally basting the chicken until a meat thermometer reads 170 degrees at the inner most part of the thigh. This usually takes another 30-45 minutes. Remove from oven and let the chicken rest at least 10 minutes before slicing. To get the lemon and orange zest I use a microplane on the lemon and oranges I plan to juice. Yum, this looks delicious! It’s a cold day today as we’re heading into winter here in Australia, this chicken would be perfect for dinner! I hope you enjoy it! It is one of my absolute favorite recipes.